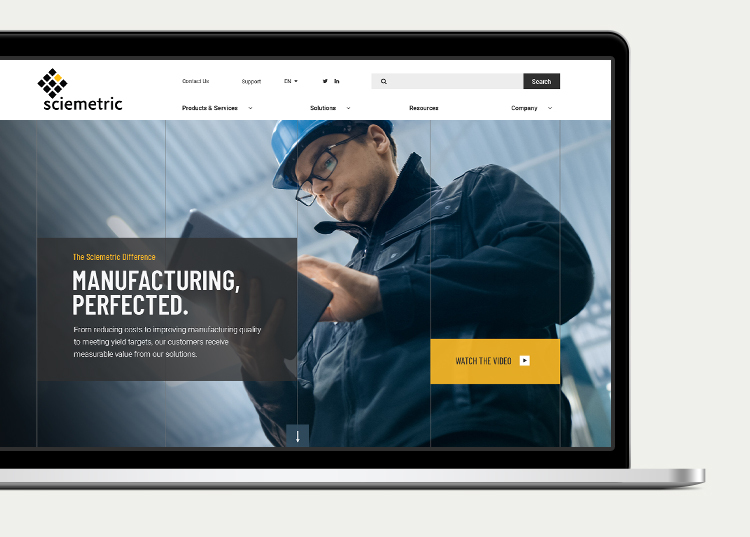 Sciemetric was ready for a corporate website refresh that better reflected their position as an industry leader in solving productivity and quality issues. The site needed to feature a bold, modern design, while still being flexible enough to accommodate various styles and different types of content. After reviewing the requirements and exploring various options, Industrial's team decided on Drupal 8 as the CMS of choice to power the site re-design. The reason for this was twofold: the site needed to be configured to be flexible enough to support numerous styles and content types, and Sciemetric's marketing team had previous experience with an older version of Drupal, so they could hit the ground running with a minimal learning curve. We incorporated unique styles like our affectionately titled "bacon strips" throughout the design, that allowed Sciemetric's team to customize their site pages to accommodate different content and marketing campaigns. Another key component to the site was integration with Salesforce, allowing leads and contact information to be passed through webforms and fed directly to Salesforce via its API. 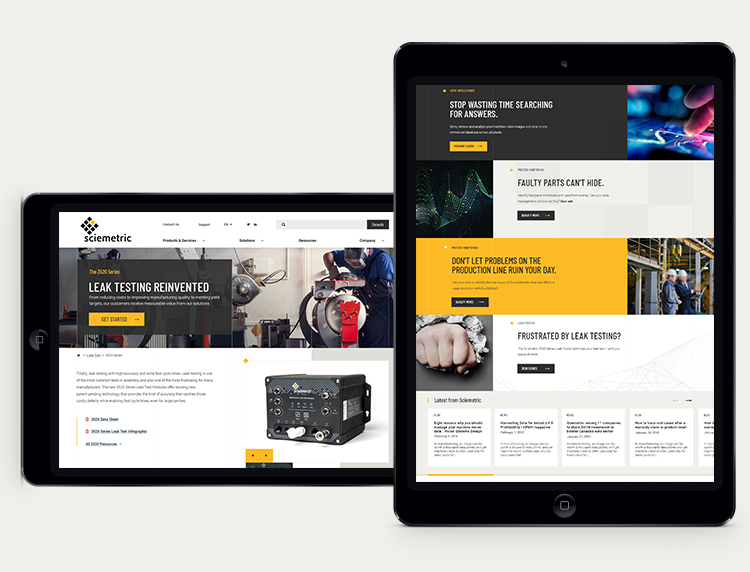 Through very close collaboration between both our teams and meticulous planning, we were able to help bring Sciemetric's vision of a modern, flexible, and beautiful website to fruition. 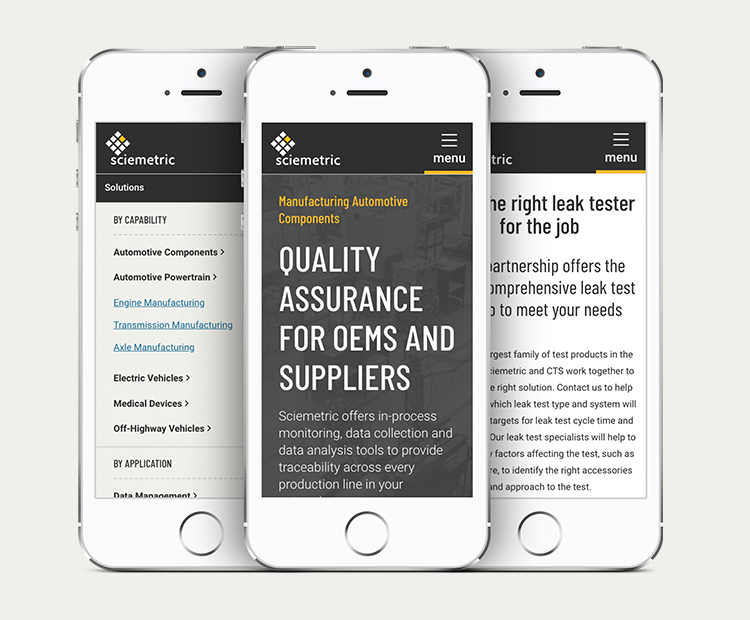 Sciemetric has been a fantastic partner to work with, and we are confident the new website will serve them well for years to come. As part of the TASI Group of Companies, Sciemetric works with Cincinnati Test Systems (CTS) and CTS-Schreiner to help customers evolve their leak test for today’s data-driven manufacturing environments. Sciemetric combines its expertise in large volume leak-testing – and in data management for traceability, test optimization, and root cause analysis – with CTS’s broad portfolio of flexible leak systems developed for a variety of customer requirements. Together, they are the partners of choice for virtually every major manufacturing vertical in need of a reliable and efficient leak test – from automotive and off-highway, to medical, consumer goods, HVAC, and military.